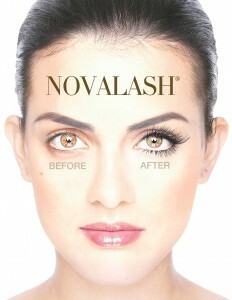 We are extremely excited to be working with Novalash, a superior brand of lash extensions. Novalash classic and American volume eyelash extensions beautifully enhance the length, fullness and colour of your natural lashes while maintaining the health and integrity of the natural lashes. After collaborating with multiple health care professionals including doctors, nurses, chemists and toxicologists from around the world, Novalash have formulated the safest possible products and techniques to provide you with less irritation to the skin and eyes while achieving thicker, fluffier luscious lashes that last for longer giving you natural and sophisticated extensions between your MONTHLY (yes that’s right monthly!) lash maintenance appointments. All directly after your treatments! At last ladies – lashes that look after themselves as well as your natural lashes, Without the harsh chemicals and endless beauty product restrictions!